"Habitat for Humanity - Habitat Young Professionals Board"
Jake joined Compass in 2013, prior to the company's launch, with a strong background in real estate development and leasing. In his first year, he procured exclusive leasing rights to a portfolio of 1,500 rental units from one of the largest management companies in New York. During his time in residential real estate, Jake was a pivotal component of testing Compass' agent products and tools. His success working with both management companies and businesses launched his transition into commercial leasing after just two years. In Jake's first three years of commercial leasing, he's brokered a number of key transactions. He represented Compass in opening two Brooklyn offices in Cobble Hill & Bed-Stuy. He also represented Etain Health to open Manhattan's first retail level medical marijuana dispensary. His work in tenant representation earned him a spot on the Commercial Observers 30 Under 30 in 2018. Jake’s unique experience during his 5-years at Compass, gives him an in-depth understanding of what a growing business needs. 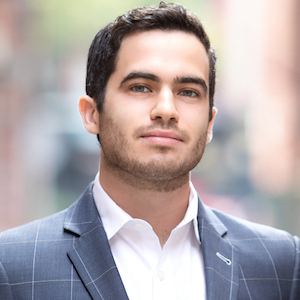 Jake specializes in tenant rep and expansion; although he works with a number of landlords in Flatiron, Greenwich Village, and SoHo. His passion is working with growing companies and advising them on their commercial real estate strategy. Jake is a born and raised New Yorker. He is the longest-tenured Compass agent.